I wouldn't want Manny Ramirez batting 4th for the Red Sox, and no number of home runs will change my mind. Sure, you could call it "cutting off my nose, to spite my face" but after watching an injured Mike Lowell gut out 9+ innings of baseball in the October air, I could care less about Ramirez. In the words of Michael Corleone, "he's WICKED dead to me now." 1. When you sign a contract that makes you one of the top (3) highest paid players in the game, you honor it. This is major league baseball folks, contracts are guaranteed. Not injury, loss of ability, or lack of available, undetectable steroids can change that. In the winter of 2000, after much speculation, Ramirez and then agent, Jeff Moorad, inked a potentially 10-year agreement worth close to $200 million dollars. The catch was that the final two years of Manny's contract, that was valued at an estimated $40 million, would only be honored on a year-to-year basis, at the Red Sox decision. Simply put, were giving you $160 million now and in year 9, as well as 10, we'll give you $20 million each season, but it's our decision, not yours. This was good for Moorad & Ramirez in 2000, but come March of 2008, with new agent Scott Boras in his back pocket along with $160 Million, Manny became uneasy with the current situation. If Manny has a bad season and the Sox don't pick up that option, he won't sniff $20 million a year. If Manny has a career year his value goes up, the Sox could then continue doing business and pay him for one year. The kicker is, Boras doesn't get a penny on Manny's current deal, he wasn't involved in that. However, if Manny enters the free agent pool, Boras gets his cut of Manny's last big deal. Picking up what I'm putting down? From the moment the Red Sox decided they wouldn't make their decision in April, but wait till they had to, BECAUSE THAT IS WHAT THE SIGNED CONTRACT STATED, Manny began acting up. Much like when you tell your child, no dessert, till you eat your dinner. 2. If the first reason doesn't seem well calculated enough for you, it gets worse. For the first time, in a long time, Manny began talking to reporters. Not just talking, but in my mind, attempting to get them on his side, sway public opinion through the media and put pressure on the front office of the Boston Red Sox. NEWSFLASH: This isn't a front office swayed much by public opinion. They refused to give 5 years to an aging and declining Pedro Martinez, on the heels of a World Series. Epstein and the front office acted similarly with the expiring contract of fan favorite, Johnny Damon. So Manny, nice effort. That isn't all that Manny did. Shoving Kevin Youkilis in the dugout in an attempt to disrupt the clubhouse. Acting out against Red Sox employee, traveling secretary Jack McCormick, and of course refusing to enter games because of phantom injuries. Not to return to a previous analogy, but I used to kick and scream when I didn't get what I wanted. Some would say that these things worked, considering where Manny resides now, but even your mom had to cave in when you were misbehaving in public. 3. With 37,000 fans cheering for you, how do you repay them? Let's get this out of the way real fast, if your that fan who scoffs at pro athletes for making the money they make, there is a simple solution. STOP WATCHING THEM! If you don't pay for cable to see them play 100+ games a season, and you don't spend $200 bucks (on the cheap end) to visit your teams stadium, guess what? THEY DON'T GET PAID. With that said, fans of the Red Sox, Yankees, Cubs, and Mets pay alot to see their sports icons play, and for men who get to play a game for a living, WE EXPECT YOU TO PLAY and PLAY HARD. For the most part, pro athletes bust their tail to win, they sweat, they cry, and their rewarded. In Manny's case, he doesn't care that you show up to watch him play, he's their to cash a check. Anyone who thinks different, remember it was Ramirez who jogged down to first after he grounded to the shortstop. IN THE MIDST OF A F'N NO-HIT BID BY A RIVAL PITCHER! How do you do that? How in front of 37,000 fans who are trying to get away from their REAL JOBS by paying you to do YOURS and YOU DON'T CARE!?!?!?! Have the words privileged, respect, and adoration ever entered your mind?!?!? I'm sure they haven't, I'm sure you could care less as well. 4. I may not like Alex Rodriguez' personalty, but I admire his effort. I never thought I'd say that I disliked a player more than A-Rod, but after watching Manny in the spring of 2008, I'm saying it. You know as Red Sox fans we are a little hypocritical, turn the back the clock to that infamous ball slapping incident, if that was a Red Sox doing that, we'd say, nice effort. Has any other player, on any other team, ever embarrassed the Red Sox more than their own MANNY RAMIREZ? He slides over to L.A., sets up shop next to Joe Torre, and all of a sudden the baseball world outside of New England forgets what he did? The guy decided he no longer wanted to play in Boston and QUIT. He faked injuries, would Alex Rodriguez ever fake an injury? A-Rod opted out to get more money, but he didn't get himself traded to get it. The only time he ever failed in the batters box was because he tried to hard, MANNY WATCHED THREE PITCHES GO BY IN A PINCH HIT AT BAT AGAINST A DIVISION RIVAL BECAUSE HE DIDN'T WANT TO PLAY. I don't like A-Rod much either, but ask yourself this, would A-Rod ever ask for a day off? 5. 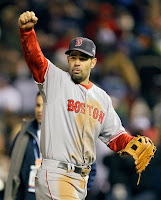 How do I cheer for Mike Lowell, Kevin Youkilis, and Jon Lester, THEN turn around and cheer for Manny Ramirez? Guys who play injured, without controversy, and never complain. I mean Kevin Youkilis is drastically underpaid. Third string catcher, David Ross, FROM THE MINORS NONE THE LESS, makes exactly $475,000 less than a potential MVP in Youkilis. Is Youk attempting to force a trade? NO. Mike Lowell has been playing with half a hip for the past two months, AT THIRD BASE, and not until the team forced him to sit down, did he sit down willingly! Ramirez experiences a stomach ache, head ache, or tooth ache, and it's three days off while his mates take on the Yankees. And Jon Lester? Well let's just say for this year, a year which he emerged as one of the games most dominant left handed pitchers, he banked only $425,000. NINETEEN AND A HALF MILLION DOLLARS LESS THAN MANNY RAMIREZ. Did you hear a peep from any of them? Did Lowell tell his manager, listen I'm taking today off and if you put me in, I'll stand like a statue at home plate. Did Kevin Youkilis attempt to convince the media that he was being underpaid and under appreciated by the Sox front office? The answers are No, they would never, because their mature adults who realize how lucky they are to be playing a game, and every day they get to play that game is an amazing thing. You know his play and attitude in L.A., only emphasizes the point. Maybe Boras engineered the whole thing, but at the end of the day, you know, as a 36-year old adult, your actions speak louder than anything. He might lead this Dodger team to a World Series, he might actually be named MVP, but how can you cheer for this guy? In 53 games for the Dodgers, Ramirez hit .396 with 17 home runs and 53 RBI's, but that is nothing shocking to Red Sox fans. What's shocking is the hustle from first to home on a single over the first baseman's head, what's shocking is the lack of respect for the fans who adored you, what's shocking is that at the end of your time in Boston, I'm actually saying, I'm quite UNIMPRESSED.